Take your kickoff steps away from the ball; just like a field goal. Taking consistent Kickoff Steps will help improve your kickoff accuracy and distance. Taking the proper kickoff steps, consistently and exactly the same way each time before starting your approach is one of the most critical aspects of a successful kickoff. If you can put yourself in the exact same position going into a kickoff every time, your chances of success will be greatly increased. On the contrary, if you vary your approach (even slightly) for each kickoff by guessing or taking ‘round about’ steps, you can be assured your kickoffs will not be consistent. Do you want to increase your kickoff distance & accuracy and maximize your kickoff efficiency? Well, read on because I tell you about one simple thing to start doing today that will improve your kickoffs. Most good kickers know that in order to hit a ‘pure’ field goal with good distance, height and accuracy it is paramount to be in the same position for each kick. Well how does one get in the same position each time? Simple, you take the same exact steps and stick with a process that is easily duplicated over and over again. For field goals, I rarely see kickers screw this up, but for kickoffs for some reason several kickers out there tend to think they can just take round about steps and get a good kickoff off every time. Well that is NOT the case! In taking your kickoff steps away from the ball, you need to walk just as you do on your field goals (walking back facing the ball/target) to make absolute certain you are walking in a straight line off of your target and so that you end up in the same exact spot each time. You may ask, ‘Coach, what’s wrong with walking facing away from the ball on my kickoffs?’ Here’s why this is bad… If you walk facing away from your ball on kickoffs, without an aiming point in front of you, you tend to ‘drift’ on your steps. There’s a natural tendency for anyone to favor one leg over the other and as you walk and subconsciously you start drifting without realizing it. These few inch variations for each kick can absolutely kill your setup which in turn will ultimately provide varying results on the actual kickoff which can crush your consistency. Let me go a little further with this. You may be scratching your head and thinking ‘Coach, I see NFL Kickers walking their kickoff steps with their back to the ball all the time, why don’t I just do it like they do?’ Well this is certainly a valid argument – If an NFL kicker does it, why shouldn’t I? Let me explain to you why this is bad for any Youth, HS or College kicker. In the NFL, every field is painted exactly the same and they employ groundskeepers for each field that uphold high standards set forth by the league to make sure all fields markings are consistent and exact. This as you can probably guess is not always the case on your youth league’s football field, or local high school or sometimes even smaller colleges (again these are variables that NFL kickers do not contend with). Furthermore, an NFL field has hash marks which are extremely close in comparison to a High School or College field. With this said, most NFL kickers who opt to walk their steps back facing away from the ball typically set up their ball on one of the hash marks. By doing this, regardless if they walk backward facing the ball or walk forward away from the ball, they will have a visual cue and alignment check by using the hash marks to ensure their steps are straight. Going even further with this, say you want to walk facing away from the ball, and you are not instructed to do a ‘deep center’ kickoff, straight down the field (such as the case for an angled kickoff to the numbers, or in between numbers/sideline like most HS coaches like), walking facing away from the ball is even worse in this situation. Your chance of ‘drift’ is going to be greatly increased as you have no alignment check. In this situation, if you were to kick 5 balls in a row, I can almost guarantee you that in at least 2 of those 5 attempts, your steps would not be the same. The objective of my ‘How To Take Proper Kickoff Steps Before Kicking a Ball’ article is to help demystify the confusion many students have about HOW TO take kickoff steps. If you get anything from this article, I hope it provides you logic and supporting documentation that taking your kickoff steps walking forward facing away from your target is quite frankly; stupid to do. Yes, I said it! Please, start taking your kickoff steps by walking backward while you are facing your target/tee/ball and utilize your alignment check which should be your tee or ball aimed toward your target (place you want to land the ball). You should also do this for field goals. How many steps should I take on a kickoff? How do I take my side steps in a kickoff? How do I approach the ball on a kickoff? Where do I strike the ball on a kickoff? How far should I plant on a kickoff? How do I follow through on a kickoff? I go into great details on kickoffs and a whole lot more in our private lessons, camps and of course my eBook and instructional kicking DVD ‘Complete Guide to Kicking’ which is a 2-Disc kicking video with over 2 hours of instruction on field goals, kickoffs, onside kicks, drills, gym training, stretches, mental game and a whole lot more! 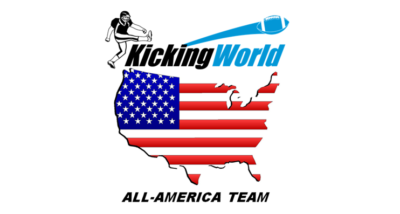 Find out more about Kicking World and what we do for hundreds of kicking, punting and snapping students across the country every year by visiting our main website at www.KickingWorld.com. Thanks for reading and have a great football season!